Trevor Brocklebank, chief executive of Home Instead Senior Care in Warrington, refuses to bid for council contracts. Former care worker Michelle Brazier Huelsman said she often started work at 6am or 7am and finished at 10pm or 11pm. Her schedule frequently required her to be in two places at once with no time allocated for travelling between calls, she said. "I used to go into the office and say if I had a pair of shoes I'd click my heels - that's the only way magically I'm going to get from one place to another place. "It all boils down to cost ultimately and for quality care what you put in is what you get out." He said: "It's impossible to deliver quality care for the hourly rate that's been offered. You have to cut too many corners, cram too may calls and that's not acceptable." The investigation, by BBC Radio 4's File on 4 programme, found the average minimum rate paid by councils was £12.26 an hour. Home care services are paid for by councils - and often delivered by agencies - to the elderly and younger disabled adults in their own homes if they qualify through a means-tested assessment. They include help with activities such as washing, dressing and eating. Colin Angel, of the UK Homecare Association, said fees being paid were too low. "Many councils exploit their dominant purchasing power in local markets to reduce prices." 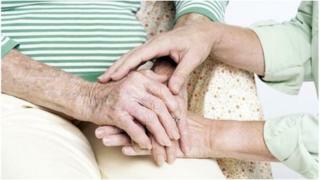 And he urged councils to work with providers to ensure a sustainable care sector was maintained. Sandie Keene, president of the Association of Directors of Social Services, said she thought the "value of care should be higher", but added the £15.19 figure felt a little high. How has the £15.19 figure been calculated? It assumes a care worker is receiving the minimum wage - currently £6.31 for workers over the age of 21. Added to that is the cost of travel - that is the time and mileage the care worker racks up doing their job. The cost of covering national insurance contributions, holiday pay, training and pensions is also taken into account. Then there are the costs the agency accrues. These can add another 30% to the cost, according to the UK Homecare Association. "We're strongly recommending that people use the UKHCA model to work through with providers alongside looking at all local conditions that would then determine what is a reasonable price for care. "But there isn't a set amount for the price of homecare because of course it costs very different amounts of money depending on where people are in the country, whether it's a rural area or a city and urban area." She also said the situation needed to be seen in the context of the squeeze on local government finances. While ministers have put extra into social care, the overall funding for all council services has been cut. Steve Reddy, operational director for adult social care services in Warrington, which had one of the lowest rates at £9.09 an hour, said councils frequently paid more than the lowest rate, particularly for more urgent, complex care. He added: "The feedback we're getting from those who use our services and their families and carers, generally is very good. "It's also public money and councils and individuals like me are also challenged to ensure that we deliver value for money." Care and Support Minister Norman Lamb said: "Local authorities must consider how they can do things differently to deliver better outcomes and quality care for people who need it. "We know there are plenty of good examples of commissioning by councils, but we want this to be the reality everywhere." File on 4 will be broadcast on BBC Radio 4 at 8pm on Tuesday 4 February.